In this tutorial I am going to design a visualisation of stock price correlations in Stator using the D3.js visualisation library. This visual study will be highly interactive allowing you to view correlations at any point in time along with the ability to view the complete correlation path for the time period being analysed. You need the latest version of Stator which includes visual studies functionality, if you haven’t already installed Stator then visit the download page to get started, it’s an easy installation. You will also need access to security price data which you can connect to using one of our many (free) data plugins. For more information regarding D3.js please click here. In the world of finance, a correlation is a statistical measure of how two securities move in relation to one another. Correlation is computed into what’s known as a “correlation coefficient” which ranges between -1 and 1. A correlation coefficient of 1 simply means as one security moves up or down the other will move in exactly the same direction. A correlation coefficient of -1 means as one security moves up or down the other will move in the opposite direction. A value of 0 means the two securities more without any relation to one another, they are said to move randomly. For the purposes of this visualisation I am going to calculate the “Pearson’s Correlation” between each of the selected securities. “Pearson’s Correlation” benchmarks the linear relationship whilst another commonly used correlation “Spearman’s” benchmarks monotonic relationship. As this visualisation looks at the linear relationship between security prices we will use “Pearson’s Correlation”. Calculating the correlation manually isn’t difficult, just tedious if the data set is large. Later in this tutorial we’ll code a generic correlation function to handle the computation. To calculate the “Pearson’s Correlation Coefficient” in a single pass you can use the following formula. For the purposes of this visualisation, the “Pearson’s Correlation Coefficient” will be calculated using a moving average of the closing price. This will provide a more stable correlation over time as the primary purpose is to identify trends in the movement of correlation. This calculation will result in a value between -1 and 1 and repeating this calculation for each date in the data period will generate a correlation-time series which we can plot in addition to a single correlation calculation. This will become more evident as we advance further into the tutorial. What key design elements do we want for this visualisation? As the user moves the mouse cursor from left to right over the date area, the underlying date will change forcing the visualisation to refresh and thus updating the plot of security correlations. Another feature we’ll develop for this visualisation is the ability to view an entire correlation path (correlation-time series). We’ll allow the user to toggle path visibility for all correlations or just a single correlation. 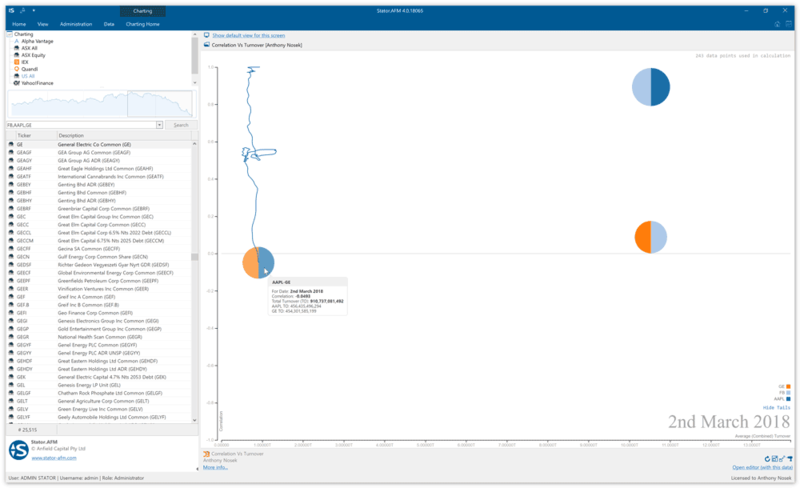 The image shown below illustrates how a single security pair correlation is overlaid onto the visualisation as the mouse cursor is positioned over the security correlation circle. So what exactly are we seeing in the picture above? It’s the correlation over time of two securities, GE and Apple Inc. The end date of this analysis is the 2nd of March 2018 and we can clearly see how the correlation has changed from near 1.0 at the start of the study (June 2013) to -0.0493 in March 2018. 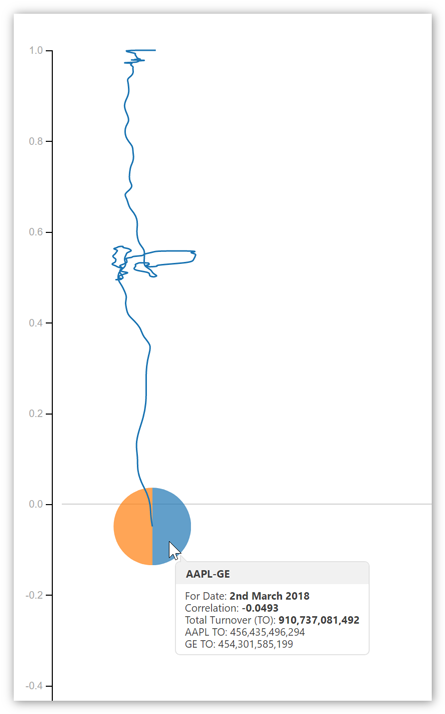 It’s telling us that GE and Apple Inc are no longer correlated- but they once were! Another important feature that needs to be mentioned here is the ability to calculate and plot correlations for multiple securities. What we want to do is allow the user to select multiple (any number of) securities using their mouse, all of which will have correlations calculated and plotted. The visualisation will determine all the possible security pairings and will calculate and display correlations accordingly. Sounds impressive doesn’t it? It’s also important to note that any visual studies which you write for Stator should be dynamic in their ability to handle data with differing ranges. That is, the data accessed by a visual study will maintain the same format with different ranges. For this reason a visual study needs to dynamically recalculate scales each time the study is refreshed or new data added. - Each data point is represented by the following JSON. - Date is in yyyy-MM-dd HH:mm:ss format (HH = 24 hour notation). // The JSON data data needs to be parsed into a ds.js date object. This visualisation relies on a lot of calculations being performed on the underlying data. To avoid code duplication we’ve written a few utility functions/methods which have single or limited scope of responsibility. Code reuse is an important aspect of smart programming and shown below are a few of the utility functions which are used in this visualisation. The following utility function takes an array as an input parameter and returns the calculated mean. So at this point you’re probably interested in seeing all the code working together. Without further hesitation please find the complete visual study “Correlation vs Turnover” shown below. This visual study is included when you download Stator and you’re free to edit and change the code to your own needs. Included with Stator is a fully integrated development environment (IDE) which you can use to test, write code and play with visual studies. // windowWidth and windowHeight are set in the HEAD section using jQuery. // This ensures the chart is sized to fill the available space. // Various accessors that specify the four dimensions of data to visualize. // The x & y axes. // Setup the SVG panel for display of the chart. // Add an x-axis label. // Add a y-axis label. // Add the date label; the value is set on transition. // Add an overlay for the date label. return "url(#grad" + d.identifier + ")"
// Positions the dots based on data. // Defines a sort order so that the smallest dots are drawn on top. // Cancel the current transition, if any. // Updates the display to show the specified date. return 	"For Date: " +  GetDateInEnglish(correlationToDate) + "
"Correlation: " + c.correlation.toFixed(4) + "
"Total Turnover (TO): " + nFormat(c.totalturnover) + "
"" + c.id1 + " TO: " + nFormat(c.to1) + "
Shown in the image below is the complete visualisation. Three securities have been selected (General Electric, Facebook and Apple) which results in three correlation calculations (three possible pairings). The mouse cursor is positioned over one of the correlation plots which forces the visualisation to draw the entire correlation path. There is also an option to display all correlation paths which is toggled with a link. Try it for yourself and let us know what interesting correlations you find!